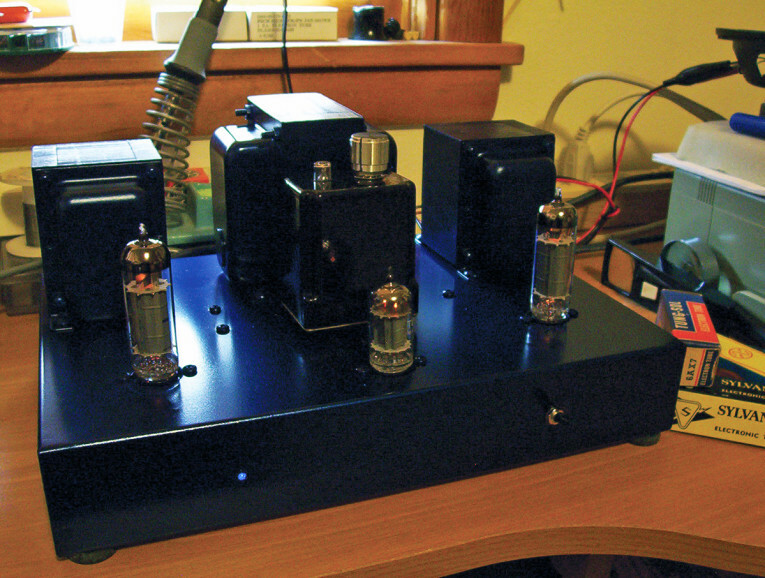 Here’s an amp project especially for first-time builders featuring the 6BQ5 tube. As Rick Spencer writes in its introduction, "In order for this beloved hobby of ours to thrive and survive well into the future, we must always strive to make it interesting to newcomers." 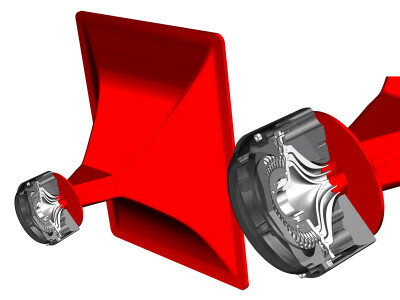 With this in mind, Rick Spencer created this single-ended design using the 6BQ5/EL84 tube in triode mode. This article was originally published in audioXpress, October 2008. 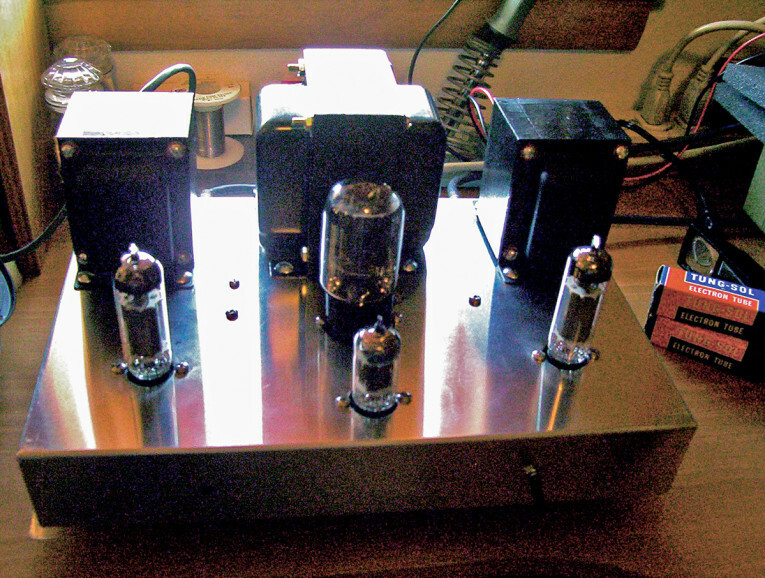 A friend of mine, Neal Haight, who has contributed many of his great ideas to this magazine, recently mentioned a lack of articles regarding what I consider to be the king of the “baby bottles,” the 6BQ5/EL84 power tube. I have built some push-pull amps using this wonderful, hard-working little tube, but even though they were fairly simple in construction and low in parts count, I wanted to build one for first-time builders, and one that would sound really good. 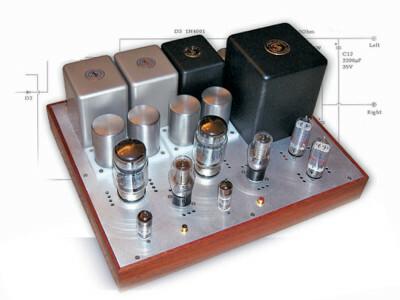 The 6BQ5 sounds great in push-pull, but what would it sound like in single-ended triode mode? I had a few of these tubes in stock in my hobby room, so I dug out the parts I would need. I ordered a chassis from Antique Electronics Supply (AES, tubesandmore.com) and found that the Hammond #H1444 was the perfect size at 12" x 8" x 2". It held all of the components and has a nice open look, giving the tubes good spacing for keeping things cool (Photo 1). I had some Hammond output transformers handy, #1645, and the load of the primaries on these transformers gave me the necessary load for the 6BQ5s into my 8Ω speakers. I used the #BR-1 speakers from Parts Express, which, although not super high efficiency, sound really good with this amp. I realize that PP transformers are not quite suited for single-ended circuits, because the SE units have an air gap in the core to keep it from saturating with DC. Using the push-pull Hammonds will cause a slight rolloff below about 50Hz, but that is close to the limits of the speakers I am using, so it does not cause any problems. 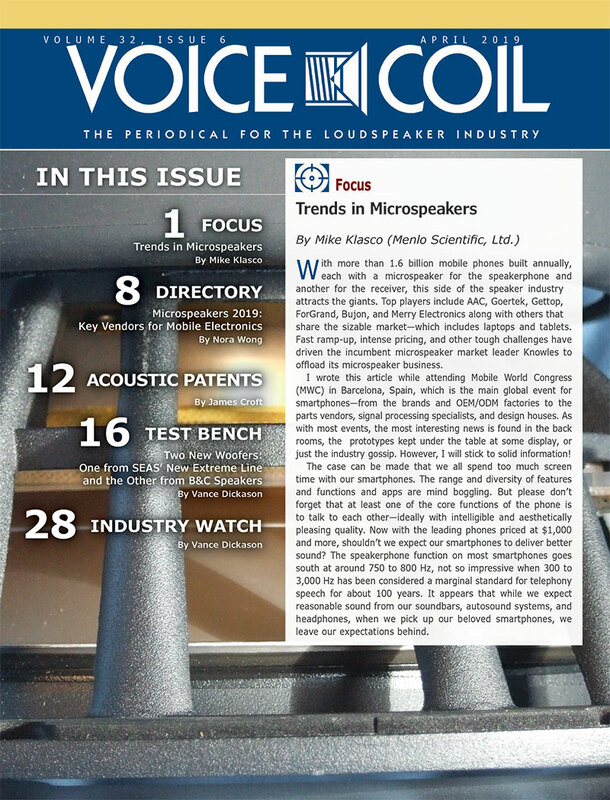 Later in this article I will explain how to keep the DC from the primary windings for those of you who want a flatter frequency response. I didn’t use it because, as usual, the engineers at Hammond are a bit conservative with their ratings, much as they were with the #125CSE transformers that I used in my “Mini Single-Ended Amp” project (aX April ’04). If you already have separate transformers for the heaters (6.3V) and the high voltage (B+) that you can use for this project, you can wire in another switch to turn on the B+ after the heaters have warmed up for 30 to 45 seconds. There will be room under the chassis for most of the small transformers that are available from AES. Any one rated for 6.3V at 4A will do just fine. 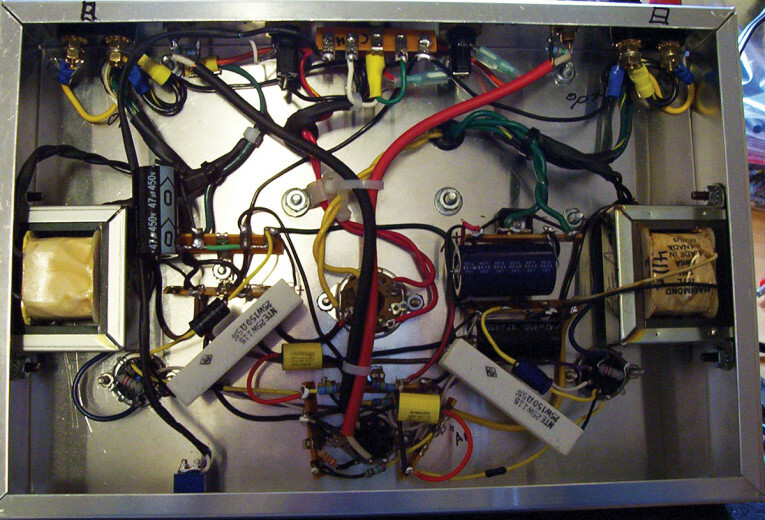 You can also wire in a switch and relay to turn on the B+ when using only one power transformer for the amp. In case you do use this switch and relay setup, then you can omit the octal socket altogether. Some of my other equipment has this switched type of “on-standby” and “operate” capability, which works well. 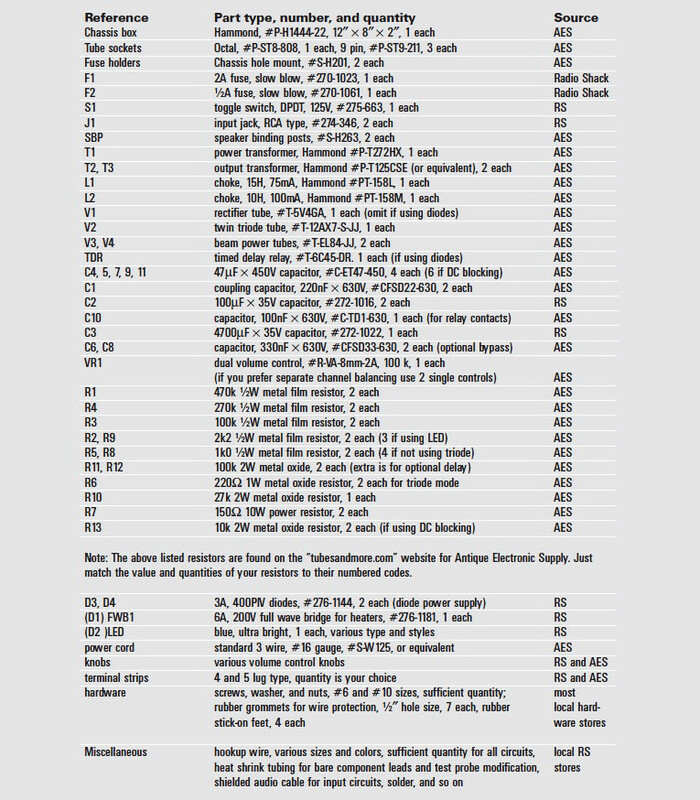 Following the wiring diagram on the schematic (Fig. 1), you should have no problem with miswired connections. The 5V leads from the 272HX go to the filaments of the 5V4, pins #2 and #8, and the high voltage leads are connected to pins #6 and #4. Be sure to connect the B+ supply wire to the correct pin, #8. The heater circuit is straightforward in that it contains only a full-wave bridge rectifier and filter capacitor. Depending on your power mains line voltage at your home, you may need to adjust the capacitance to keep the heaters at around 6.3V DC (+/-10%). Increase or decrease the capacitance accordingly. I used some standard electrolytic capacitors for the B+ filtering (47µF x 450V), which seemed to filter the B+ quite nicely. Be sure to observe polarity with these caps! I normally use bypass capacitors in the HV, and you may use them if you prefer to “tailor” the B+ to your liking. A 330nF x 630V DC usually does the trick. The hum and noise in the amp is minimal, and you can only hear it when you place an ear close to the speakers. 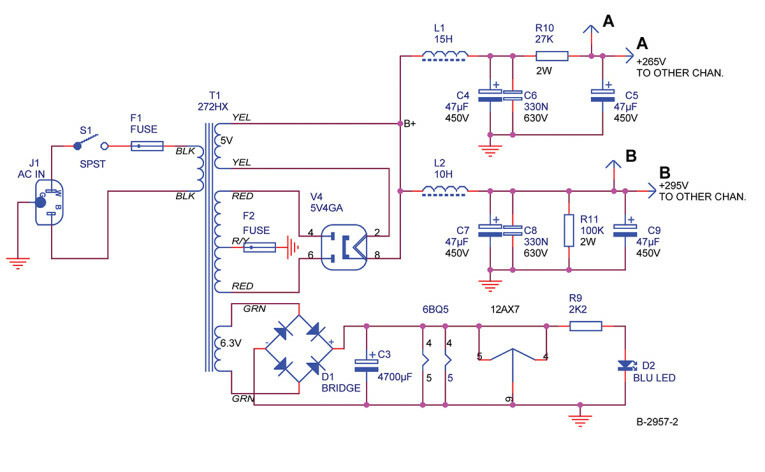 If you decide to use diodes for your B+, then use the optional power supply diagram included with the schematic (Fig. 1). Use good-quality diodes. Both the standard 1N4005 and the high-quality Hexfred diodes are available from AES. When using diodes, you can add some extra filter capacitors to help smooth out your B+, which you can’t always do when using rectifier tubes. 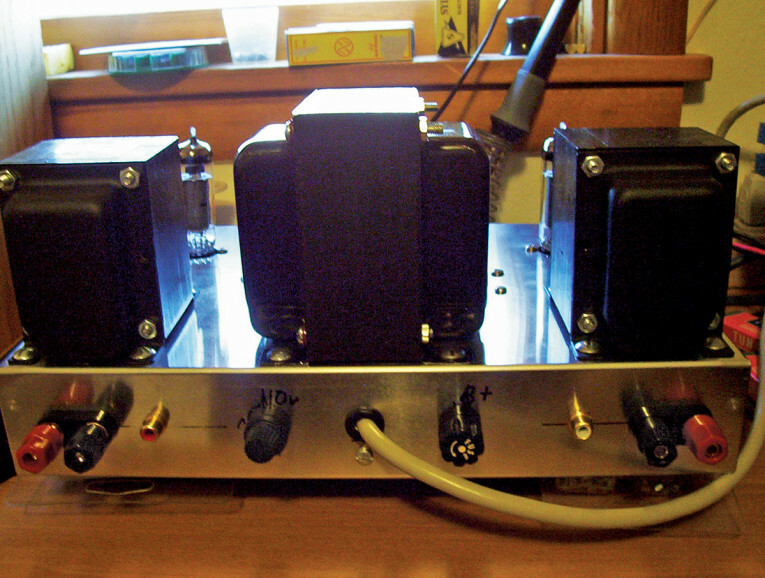 I built two of these amps using both types of power supplies, and I can’t really find much difference in the sound. I can’t say enough about the Tung Sol tubes. I used their 6550s in my single-ended project (aX Sept. ’01), and they remain my favorite brand. I realize that most of them are not available anymore, or are too costly, so I am listing other brands for this amp. There are many good 12AX7s available today to choose from. Just remember to wire the 12AX7 for the proper heater voltage. The 6AX7 (12AX7) tube makes it easy to drive the amp to its full power. 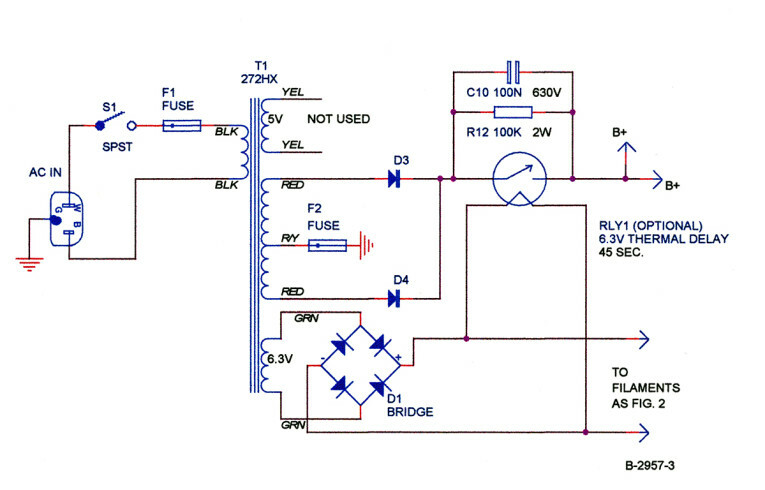 Using the circuit as shown with an input of around 0.1V drives the amp to a comfortable listening level when you use speakers that have an efficiency of around 90dB. And when you increase the input to around 0.5V, the amp is driven pretty hard and the distortion becomes evident. 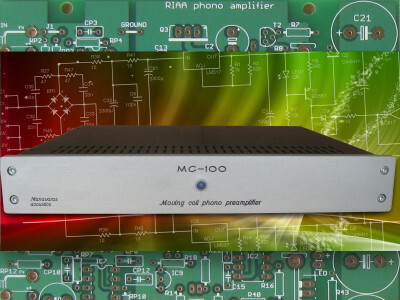 So, if you choose to use the amp in a direct-connect setup with your tuner or CD player, you will need some sort of volume control to prevent it from being overdriven. The 6BQ5s — the power output tubes — are still easy to obtain, with many different brands to choose from. They deliver about 2W in triode mode, or, about 5W in pentode mode. These tubes are very rugged. Many guitar players still use practice amps that have them in either SE or PP configuration. Personally, I have never replaced a 6BQ5/EL84 due to failure; some have become a little soft sounding as they aged, but, hey, that’s normal. The tube uses cathode bias, which makes the circuit simple and allows you to try different tubes without needing to worry about any adjustments. I tried some JJs that have a lot of mid-bass punch and a good bottom end. I also used some NOS Sylvanias which have a fantastic clarity about them. The midrange from the Sylvanias is great, and the tubes seem to cause the little amp to take on a personality of its own. I thought my “Mini Single-Ended Amp” sounded good, but, wow, the 6BQ5s are right at home running in SE triode mode! 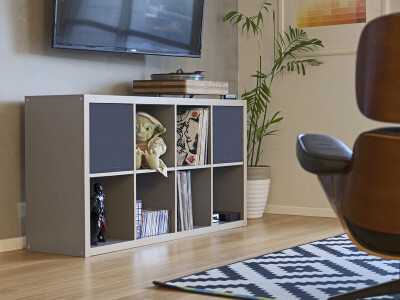 The Hammond chassis box has plenty of room for all of the parts you will use to complete your amplifier. You will need a couple of hole punches for the tube sockets. The sizes are 0.75" and 1.125", or, in layman’s terms, ¾" and 1 1/8". Or, you can have your local electrical shop punch out the pre-marked chassis holes with the Greenlee brand of punches that will do the job very neatly and quickly. Some hobbyists use a proper-size drill or metal nibbling tool such as the #ST806. Whatever works for you is OK. When working with the chassis, be sure to remove all of the shavings and burrs that are left over from drilling and punching the metal. 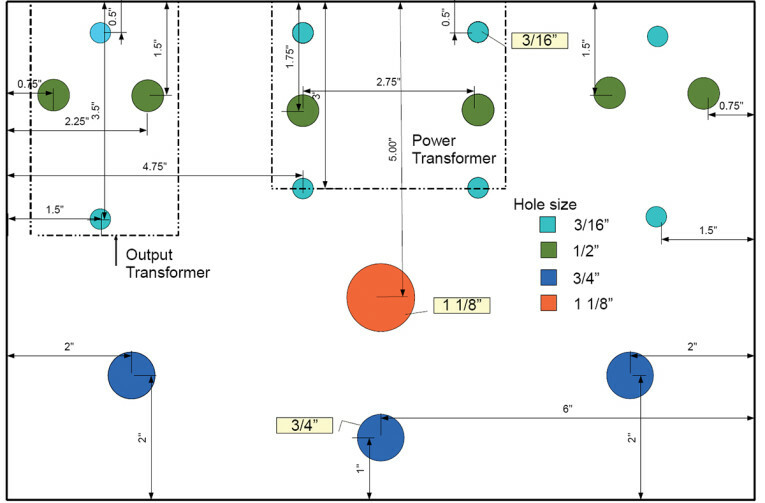 The spacing and hole sizes for the transformers and the placement distances are on the chassis drawing (Fig. 3). 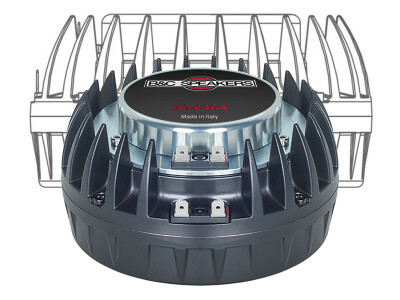 The mounting holes on your output transformers will vary, depending on which one you decide to use. Using this drawing will help take the guesswork out of where to put things on your chassis. Actually, you may arrange your amp however you wish, but I found the layout here works very well. You can see some good views of the amp layout in Photos 1, 2, and 6. I put the power switch on the right side because I’m right-handed. I used #6 hardware for all of the mounting of the chassis top parts except for the transformers. I used #10 for them. The types of terminal strips in Photo 3 are very handy for mounting all of your components and are available from AES or your local electronics store. You may use as many as you need to complete your chassis wiring hookups. You can mount them wherever you consider to be a good tie-in point for your wires and parts. 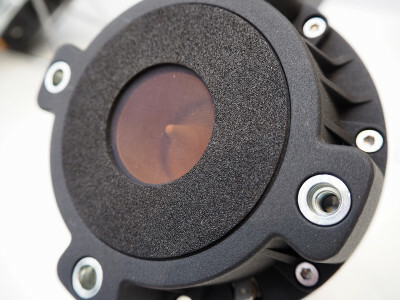 The socket mounting hardware is always a good place for them because you will terminate almost everything into the tube socket connections. Try to route the wires carrying the AC power (120V) from your supply line away from your low-level signal wiring to reduce the possibility of any induced hum. Be sure to use rubber grommets on the holes that wiring will pass through on the top of the chassis and on the power wire hole in the back plate. Photo 2: Rear view of amp. Photo 3: Inside chassis view. If you prefer to experiment with the hookups for the transformer, just remember to isolate and insulate the unused wires. You can use the extra circuit in Fig. 1B if you want to block the DC from the core of your amp’s output transformer, but if you use a Hammond #125CSE you won’t need it. 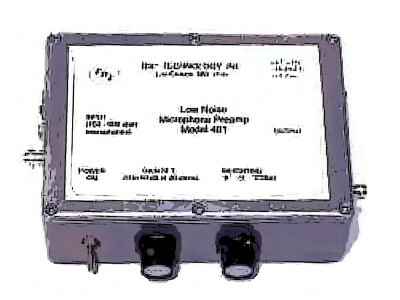 Larry Lisle, whose work I have always admired, demonstrated this method in an article back in 1996 in Popular Electronics, where he showed how to construct an all-triode SE amp. I’ve never used the circuit, but if Larry says it works, that is good enough for me. If you don’t already have some PP transformers on hand, then just order the 125CSEs and you can avoid the extra circuit. One of the advantages of a single-ended amp is the low parts count, which means simplicity. Because it is single-ended, there is no need to use a phase inverter. I am not even using any feedback in the circuit. By using cathode bias for the output tube, you don’t need to worry about a separate power supply for the bias. This is accomplished with the use of the resistor and capacitor on the cathode of the 6BQ5 to ground. I experimented with different values of capacitors for the bias and settled on the one on the diagram after extensive listening tests; again, tuning by the ear, not the meter. In Photo 3 the amp is still under construction, and yet it should give you a basic idea regarding the placement of parts, but you can arrange yours in any way you wish. 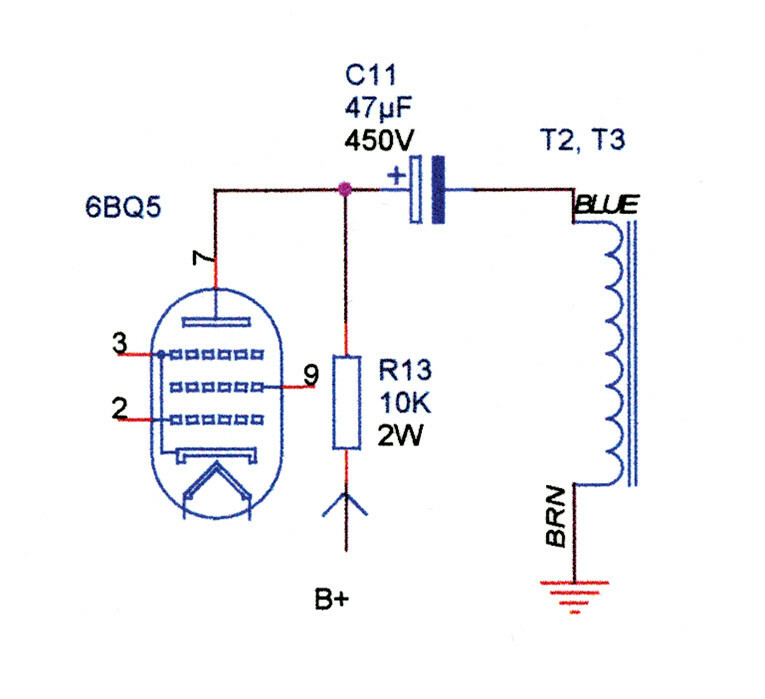 In order to use the 6BQ5 in triode, you must connect the plate, pin #7, to pin #9, as shown in Fig. 1A using a 220Ω 1W resistor. If you don’t want to use triode mode but want more power, then connect pin #9 directly to the B+ going to the output transformer using a 1k0 resistor. 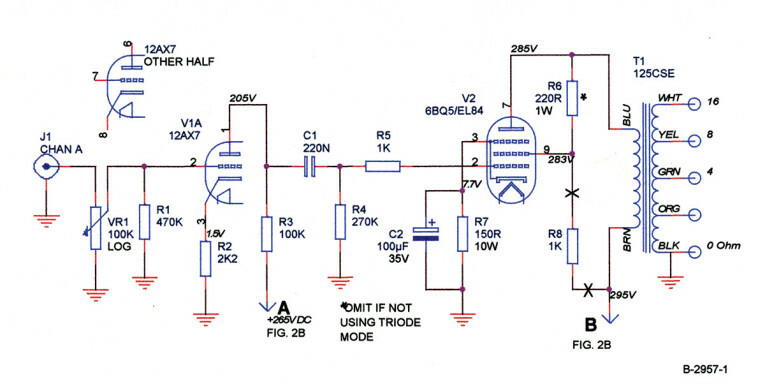 This option is shown on the schematic diagram including the extra resistors. Personally, I like the triode mode better. Photo 4: Amp under test. Photo 5: A safer test probe. Before you start testing the circuits for proper voltage readings, you must remember that you have some high voltage under that chassis, both the mains power and the B+! 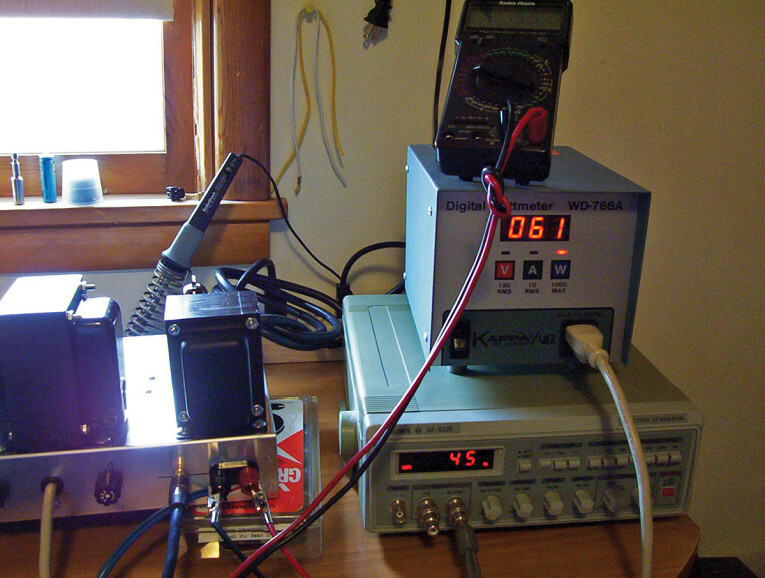 The 6.3V and the 5V supplies will forgive most mistakes; the 120V AC and the B+ will forgive none! 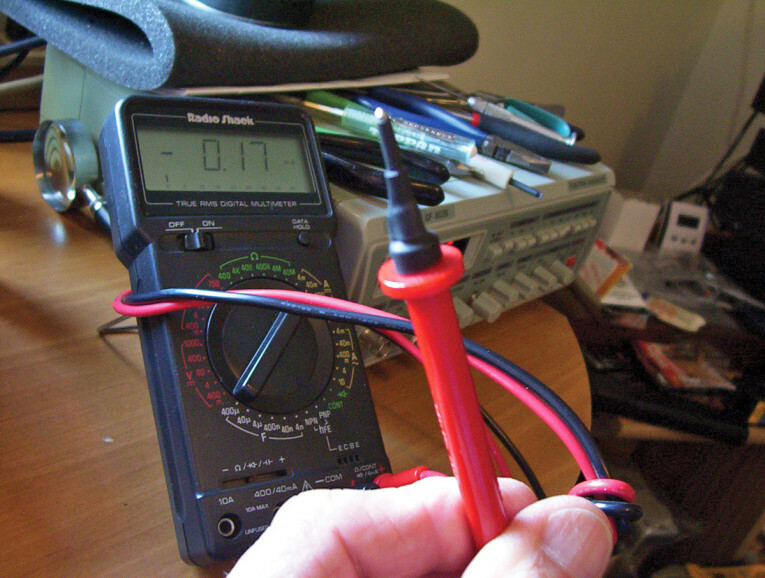 If you are not used to measuring these types of voltages, you should do everything possible to ensure that you will have a safe and satisfying experience learning how. If you don’t have a test meter, these are available from your local electronics store. Read the instructions that come with your meter and practice measuring with it on some low power circuits such as batteries, resistors, and so on, until you feel comfortable with its operation. Remember, your eyes can only see the components of your amp, the meter will tell what is actually going on inside of the circuits. Put the B+ fuse back into its holder and connect your speakers to the proper terminals, observing the polarity. Plug the amp back in and turn it on. Watch for the soft glow of the heaters on the 6AX7 (12AX7) and the 6BQ5s and the glow of the filament on the 5V4 (unless you used the diodes for your power supply). Your heater, filament, and B+ readings should all be close to normal. Sometimes in my area the utility power voltage will go as high as 125V and the B+ in my amp will hit around 300V. This doesn’t really cause any problems because the tubes are rated for 300V. They will become slightly warmer and I notice a little increase in the volume, but that is not serious. If you notice that a bad solder joint is making a problem, turn the amp off, unplug it, and wait for the capacitors to discharge. Photo 6: Front view, painted chassis. Solid-state power supply version. At first I did some frequency response tests from the amp (Photo 4), but that is never close to the dynamics of real music. I played a track from Toni Braxton, “Spanish Guitar,” and noticed how the sounds of the strings — actually each individual string — of the instrument seem to come forward from the speakers until I felt as though I could reach out and touch them. I played a variety of music from classical to soft rock, to country, and some oldies but goodies, and I started to hear things that I hadn’t noticed on other amps, especially solid-state. So, I wonder, how can this simple, inexpensive amp stand on its own with some of my other equipment? There are very few parts in the signal path, and the triode sound is virtually unmatched in audio amps. I listened to a 300B amp once, and, let me tell you, that will spoil your ears real fast. I realize that this amp is not a “true triode” amp, because I’m using a pentode that is strapped into triode configuration, but I think that the little 6BQ5/EL84 is happy running in triode mode. If you are a first-time builder, remember to take your time as you go through this project. Don’t rush. To hurry can only produce mistakes, while taking your time will cause you to absorb the reason and purpose of your endeavor. 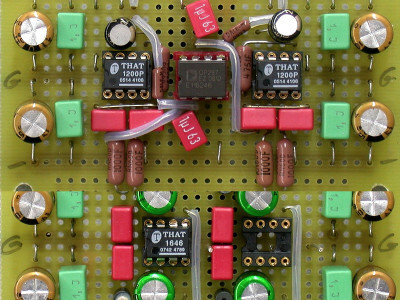 This way you will learn and understand more about vacuum tube circuits. 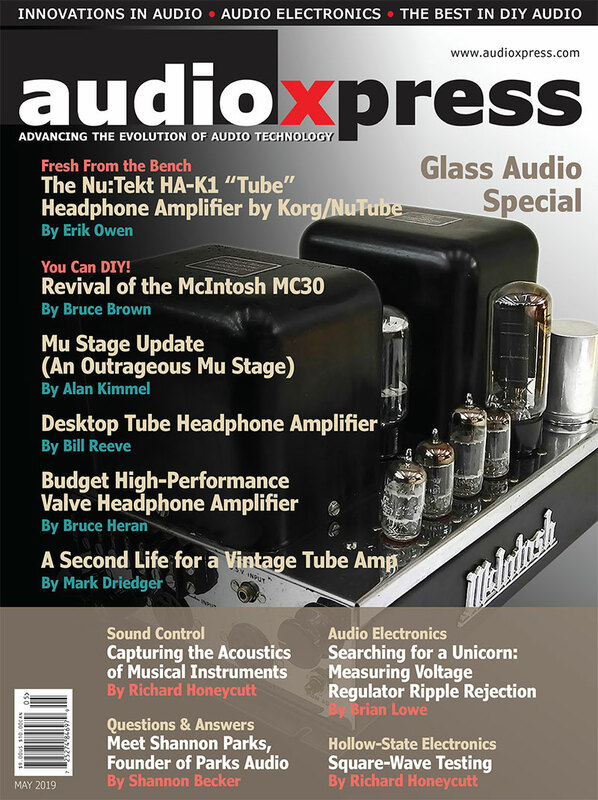 If you desire to learn even more about the “why” and “how” of tube equipment, obtain some of the books available from audioXpress. This article was originally published in audioXpress, October 2008.